When it Comes to Trail Riding the New Polaris Outlaw is in a Class of its Own. Home > When it Comes to Trail Riding the New Polaris Outlaw is in a Class of its Own. If you haven't ridden a quad with Independent suspension you'll find the difference it makes to ride quality and tough ground hard to believe. The Outlaw ATVs from Polaris never seem to run out of ground clearance. You can slam almost anything on one - hard-edged potholes, small washouts, rocks, stumps, the whole trail riding shooting match - and the suspension couldn't care less. It simply glides over all this without deflecting or bottoming-out. And while pulling off this stunt it manages to give you fantastic ride quality. You're having a ball because you're not being belted around, and you're riding faster than you could on anything else. Polaris says the Outlaw and Predator 500 ATVs share the same engine 'with a few small differences'. No doubt that's true, nevertheless the Outlaw feels faster. We're willing to concede this is an impression created by this quad's superior speed over rough ground; you're riding faster on it than you could on the Predator on the same terrain. Still, whatever the differences between this engine and the Predator’s, this one feels stronger and that's a good thing if your mates are on TRXs and YFZs and you're expected to go hard or go home. This is one hell of a trail engine. Apart from endowing the Outlaw with real speed, it's stuffed full of torque. To prove this we rammed the poor quad up a gnarly hill with plenty of rock shelves, separated by loose, scrabbly material. It went up easily in first gear with no help from the clutch. It went up in second gear with no clutch. It went up In third gear with no clutch (bugger me! ), add then went up In fourth gear, this time with a feathering clutch to keep the revs percolating. That's real torque, and exactly what you need for blasting along your favourite trails without shift dancing or revving it hard for every little bump and rise. With light steering the Outlaw turns well and is easy to muscle through tight turns. It also jumps nicely and feels well balanced in the air. Having wide axles like the new Suzuki 450 is certainly an advantage on a racetrack but no particular benefit in trail riding. A wider track only increases the turning circle and reduces manoeuvrability, exactly what you don't want when you're chasing your crazy mates through the undergrowth. We thought suspension on the Polaris was outstanding. For trail riding we'd swap wide axles for independent suspension any day. If you took the Yamaha, Honda, or Suzuki along the mountain trails where we evaluated the Outlaw you'd come back with aching wrists and busted arms. 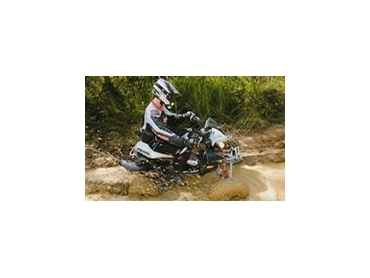 These sports ATVs just aren't designed for belting along bad trails. They're happy as a mad monkey on a racetrack - Suzuki is explicit about the QuadRacer 450's role in life - but chuck 'em on a chopped-out trail, and in standard trim they'd be screaming for mercy. To be honest, having ridden some pretty serious pumped-up ATVs lately we wondered if the Outlaw engine was a match for these meat eaters, but from a trail rider's point of view there's no need to stress. The Outlaw is genuinely quick. It could use a little more bottom-end, maybe a pipe would help, but that's the only thing that would make this a better engine for the average trail rider. We've evaluated a lot of ATVs over the past three months. Some have been faster than the Outlaw but none has been more fun to ride. Nothing comes close to this thing. If what you love most is riding as fast as you know how along trails you know well. This is a drop-dead, free-for-all fun machine and worth every cent. Words and Photos courtesy of ATV Action Magazine – Australia. Issue 3.